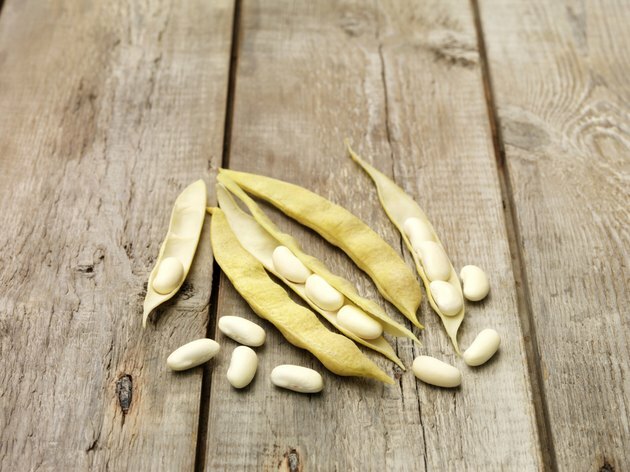 Peruano beans are mild beans from Mexico that are light cream, buff or yellow, with a mild taste and creamy texture. They can be used in any recipes that call for navy, canellini or pinto beans. Although the beans are a common ingredient in Latin American cooking, they originated in the Andes Mountains in Peru. Peruano beans are also called azufrado, canary, mayocoba or Mexican yellow beans. Rinse the beans and look through them for small stones or other unwanted material. Cover the beans with water and soak them overnight. Drain the beans when you are ready to cook them. Cover them with 4 inches of water in a large pot. Bring the pot to a boil, lower the heat and simmer the beans until they are tender, about 20 minutes. Slice the chorizo and cook it in a large pot, stirring until it is cooked through. Drain off as much grease as possible. Add the onion and garlic and saute until the onion is translucent. Stir in the tomatoes. Allow the chorizo mixture to cook over low heat while you drain the water from the beans. Add the beans and stir to combine all the ingredients. Taste for seasoning and add salt and pepper if necessary. Heat the dish and serve, garnished with the chopped cilantro. If you don't have time to soak the beans overnight, put the beans in a pot and cover them with cold water. Bring the water to a boil, turn off the heat, and let the beans soak for 1 hour before cooking. Substitute any kind of pepper you prefer, such as serrano chilies or green bell pepper. Substitute 4 oz. of bacon for the chorizo. Add canned tomatoes if fresh tomatoes are not available.